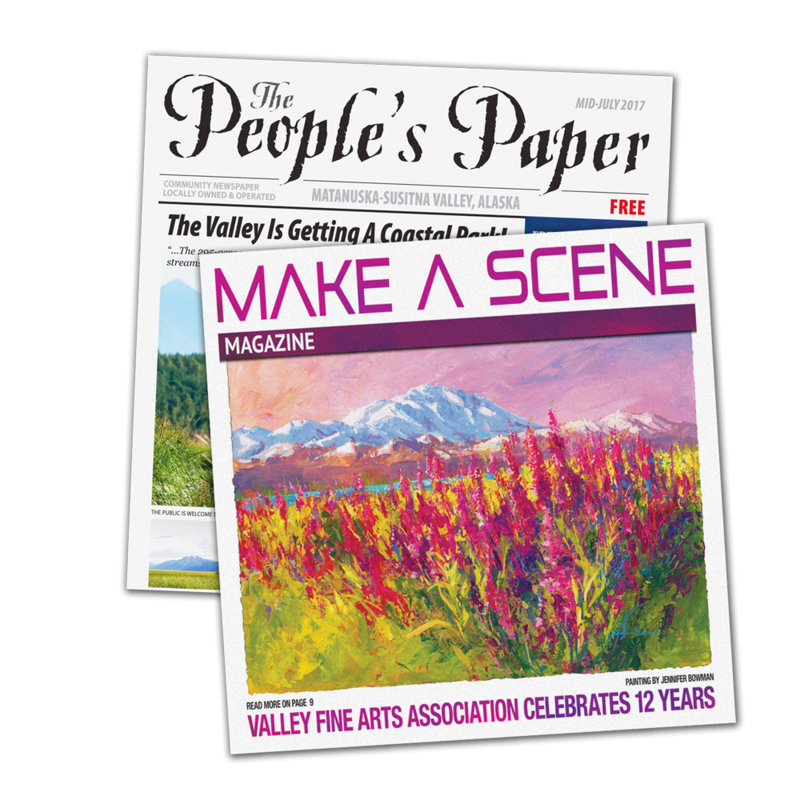 Non-Profit Directory — The People's Paper & Make A Scene! Alaska Animal Advocates is a non-profit group of dedicated volunteers who are devoted to enriching the lives of companion animals in Alaska. In order to do this, we will place homeless pets in loving environments, address medical concerns, spay or neuter, microchip, vaccinate, and offer training as is needed. We believe that every animal deserves a loving home, for his/her entire life and Alaska Animal Advocates will provide the resources to make this happen. In order to make this mission possible, we need the help of volunteers and foster homes. Valley Arts Alliance, bringing the community together through the arts... We are a place for both new and established artists of all types—painters, sculptors, musicians, and those involved in the performing arts—to network and to experiment with new ideas and media. We work with local libraries, schools, museums, art councils, and music and art groups to create more venues for the arts, and to help promote art related events. Join us at our informal weekly meetings, every Thursday @ 11 at Sophia’s Cafe, 9191 E Frontage Road, Palmer-Wasilla Hwy. Check out our archives www.ValleyArtsAlliance.com. RECYCLING - It’s not just for hippies anymore! Everyone in the Mat-Su valley can recycle. Drop your stuff off Tues – Fri 10:30 to 6 and Sat 10:30 to 3:30. Recycle cardboard, magazines, this newspaper and more at your community recycling center. Remember to REDUCE, REUSE, and then RECYCLE! We are located at 9465 E Chanlyut Circle, next to the MSB Animal Shelter at the MSB Central Landfill. Volunteer opportunities available. Make a difference in your community! Check out our website for details, www.valleyrecycling.org - Call us at 907.745.5544 with questions or comments. Mat-Su ABE provides basic education in math, language arts and English as a second language (ESL), aiming to raise student skills beyond the high-school level in order to pass tests like the GED, enter training programs or college, and advance on the job. Enrollment is open to all adult residents of Alaska, year-round. Connect Palmer is a Christ-centered training center and housing for women located in downtown Palmer. Connect Palmer’s two primary programs are God’s Work Design and LIFE Connect. We also have Sarah’s House, which a safe and caring place for ladies without homes to live while they participate in our back-to-work and life skills programs. We also offer different community assistant programs, such as The Locker to provide personal care and basic household cleaning items and Scarlet Tapestries which offers basic sewing skills instruction. We are a 501c3 non-profit organization. To address quality of life issues for all residents of the Mat-Su Borough, utilizing the faith values of our members, developing community-wide interest and mobilization around quality of life issues. Through training, leaders address community problems by providing forums for discussion, researching alternative solutions, and working as facilitators with residents and leaders for institutional change. Denali Family Services provides therapeutic foster care to Alaskan children with mental health needs. If you are committed to working with a team, receiving training and implementing positive interventions to school-age children and teens, we need your talents and skills. We are in search of professional, therapeutic foster parents who are willing to make a commitment to the children of Alaska by providing a stable home environment. For more information, please call or email our Foster Care Recruiter, Ernestina D. Olivares, at 907-222-2331 or eolivares@denalifs.org. MY House is a homeless youth drop in center with two for-profit businesses that train and employ homeless youth. Gathering Grounds Cafe is a coffee shop with homemade soups, sandwiches, salads and baked goods. Steamdriven is a trendy thrift shop featuring Steampunk items made from repurposed donations by our youth designers. Fiend2Clean and Young People in Recovery offer support for substance abuse recovery with activities and events. We offer transitional housing for qualified 18-24 year olds, Outreach services to connect homeless youth, organizations and groups to services, and access to Public Health and NineStar job/education services on site. The Mat-Su Health Foundation offers financial and strategic support to well-managed 501(c)(3) organizations that offer services and practical solutions to significant health-related problems impacting the citizens of the Mat-Su Borough. The foundation also offers academic and vocational scholarships to Mat-Su residents who wish to pursue health and wellness related careers. Dedicated to improving the health of our community one person at a time – through affordable medical dental and behavioral health care. The clinic is a Federally qualified Health Care Center and we accept Medicare, Medicaid, and most other third-party insurances. For those who qualify, there is a sliding scale payment based on household income. Those who are without insurance are under insured or who have insurance are all welcome to call and schedule an appointment with us. We offer early morning and evening appointments - you can also contact our 24/7 behavioral crisis intervention line by calling the main number: 376-2411. Now offering services in our new location at the East Lake Mall in Big Lake. “CAN YOU HEAR ME?” Sertoma stands for Service to Mankind. Mat-Su Sertoma is a 501(c)3 non-profit membership organization whose purpose is to support hearing health in the Mat-Su Valley through education, hearing testing and support of services that assist individuals with deafness and hearing loss. Mat-Su Sertoma membership is open to the public. Anyone can attend one of our membership meetings. Won’t you join us on the 1st and 3rd Thursday of the month at the Windbreak (Trout House) 6:30 p.m. to 7:30 p.m.? Wasilla Homeless-Committee is a 100% volunteer organization funded by private donations and regular fundraising events. Our sole purpose is to assist the homeless, those at risk of homelessness, and others who do not meet the criteria for help that is required by other advocacy agencies in the valley. Wasilla Homeless-Committee provides case management, housing search assistance, move in assistance, job search assistance, clothing, furniture, help with transportation, and resource guidance for homeless and disenfranchised in the Mat-Su Valley.